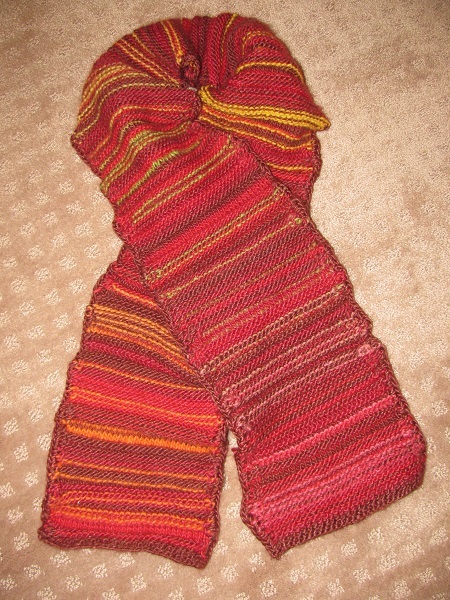 Sonderbooks » Blog Archive » Jade’s Finished Outliers Scarf! Today I finished the Normal Distribution Scarf I made for my transgender daughter Jade! This scarf shows that it is the outliers that make life beautiful. A lot of things in life have a normal distribution — height, intelligence, and many other things. Most people are somewhere near the middle of the bell-shaped curve. All her life, Jade has had qualities that are outliers. And I do believe that has much to do with why she is such a beautiful person. She definitely adds spice to life! 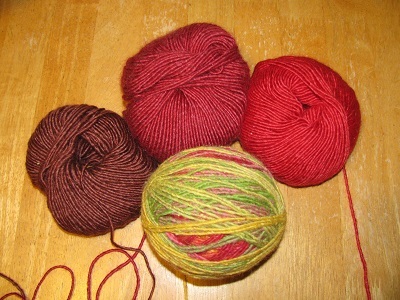 I chose four colors of yarn. Then I generated random numbers from a normal distribution. I used the website random.org/gaussian-distributions/. The numbers told me what colors to use for each row. For numbers from -0.5 to 0.5, I used brown, Color A. For numbers from -1.0 to -0.5 and 0.5 to 1.0, I used a brownish burgundy, Color B. For numbers from -1.5 to -1.0 and 1.0 to 1.5, I used bright red, Color C.
For numbers less than -1.5 and bigger than 1.5, I used a rainbow yarn, Color D.
The rainbow yarn changed only gradually. It started out orange and gradually changed to yellow, then green, then pink. But this yarn for the outliers definitely is the most noticeable yarn throughout. The only thing I didn’t like about this scarf is that there were far too many ends to sew in, and I didn’t feel like I did a great job of covering that up with a crocheted edging. If I make a normal distribution scarf again, I will probably knit it lengthwise, even though that won’t use as many numbers. I was also thinking I’d like to use an additional color for 1.5 to 2.0. Then the outliers yarn would be more rare. I also might try using an amount of 0.75 for each section instead of 0.5, so that the sections would be 0 to 0.75, 0.75 to 1.5, and 1.5 to 2.25. I’m going to test these two ideas on a coloring sheet before I try knitting another scarf. You can find various more mathematical knitted objects and coloring sheets at sonderbooks.com/sonderknitting. This entry was posted on Thursday, February 4th, 2016 at 11:54 pm and is filed under Knitting, Mathematical. You can follow any responses to this entry through the RSS 2.0 feed. You can leave a response, or trackback from your own site.